Definition: The Virginia Plan, also known as the Large State Plan or the Randolph Plan, consisted of 15 resolutions. The Virginia Plan proposed a structure of government to the Constitutional Convention that was held between May 25, 1787 and September 17, 1787 at the Pennsylvania State House in Philadelphia. Summary: The Virginia Plan was presented in the form of fifteen resolutions that detailed reasons why the Articles of Confederation should be radically altered and plans for a strong National Government that could collect taxes and make and enforce laws. The Virginia Plan was based on a national and state government system with a Separation of Powers consisting of legislative, executive, and judicial branches. A bicameral legislature (two houses) consisting of the House of Representatives and the Senate would feature proportional representation. Who proposed the Virginia Plan? The Virginia Plan was sponsored and proposed to the Constitutional Convention by Edmund J. Randolph on May 28, 1787. Edmund Jennings Randolph (1753 – 1813) was a lawyer and the Governor of Virginia who introduced and defended the Virginia Plan to the Convention's delegates. The 15 resolutions of the Virginia Plan immediately broadened the debate from revising the Articles of Confederation to including what form the structure and power of the national government would take. Under President George Washington, Edmund Randolph would become the first Attorney General of the United States. Who wrote the Virginia Plan? The first delegates to arrive at the Constitutional Convention were the delegates from Virginia that included James Madison (1751-1836). The enthusiastic James Madison drafted the Virginia Plan whist waiting for the conference to begin, he was the youngest delegate to attend the Constitutional Convention. The Virginia Plan was the first document to suggest a separation of powers into executive, legislative, and judicial branches. James Madison was a political theorist, a planter and a politician who would one day become the 4th president of the United States. The work of Montesquieu (1689-1755) had a powerful influence over James Madison. Montesquieu was a French political theorist and a champion of liberty who was famous for his verbalization of the theory of separation of powers. What did the Virginia Plan Propose? Resolution 4: The people of each State should elect the First Branch of the National Legislature. Who Supported the Virginia Plan? The Virginia Plan was supported by the larger states because of the resolution for proportional representation. This meant that the more people a state has, the more representatives it gets in the legislature. Who Opposed the Virginia Plan? The smaller states opposed the Virginia Plan because the resolution for proportional representation would mean that smaller states would have less say in government than the larger states. If the Virginia Plan was agreed each state would have a different number of representatives based on the state's population. The small states therefore proposed the New Jersey Plan. The names of all the Virginia delegates who attended the Constitutional Congress are detailed below together with those who signed the Constitution. 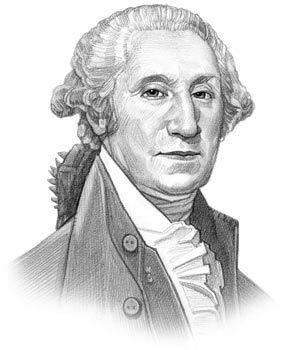 The article on the Virginia Plan of the Constitution the facts and history of one of the major events that occurred prior to George Washington's presidential term in office. The following video will give you additional important facts and dates about the political events experienced by the 1st American President whose presidency spanned from April 30, 1789 to March 4, 1797.